Even I find it hard to believe that it’s over 4 months since I wrote a blog post. Time certainly travels very quickly and my writing and photography have not been used much. I’ve managed to write a short article and have some others in the pipeline, but progress is slow. Too many other things I have to do. There is much in the press at the moment about the NHS, as it celebrates its 70th anniversary. I can remember, just, the days before it came into being. In fact, I was a patient before it started, but have no idea how any consultations or treatment was paid for by my parents. 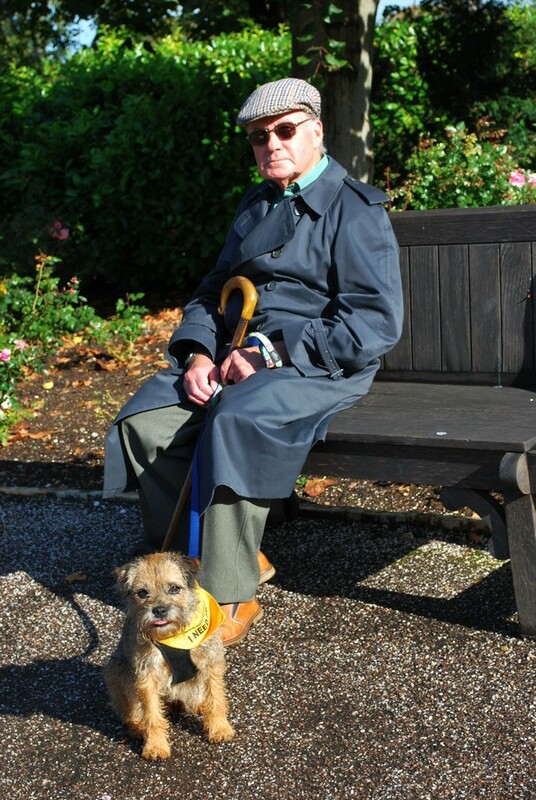 When Mike, my husband, and I visited Poole Hospital at the end of last year many of those memories came back to me. This was mainly because, in the hours we spent there, I had time to peruse photographs on the wall, telling of the early days in that hospital. How old-fashioned the nurses looked compared to how they are dressed now. There were photographs of the children’s ward in the early 1950s – obviously by this time run by the NHS. I studied them well in case I should find myself in one of them, but no. I was an out-patient from about 1948 onward, for the next 15 years, and a few times since. I was also an in-patient on at least two occasions, once for surgery and once for observation and tests. Strangely, I liked being there; the nurses were lovely and caring, and the doctors and other staff. I had my own make-believe uniform and stethoscope, and used to follow nurses around the ward. One bad memory of my time in the hospital exists. When I was due to go for surgery, a young nurse gave me a cup of tea. I had no idea that I was ‘nil by mouth’ and drank it. When it was discovered, I needed my stomach pumped – not a pleasant experience. I just hope the poor nurse was not in too much trouble for an innocent mistake. The other thing which I didn’t enjoy was the smell of the rubber mask as I was being anaesthetised. Later I returned to the hospital to work there, which I did for 7 years before moving to another part of the UK. How the NHS has changed over the years. Their medical expertise means that more of us live longer, plus there are so many people in our country. Every aspect of the NHS is under pressure; let’s hope it can survive and thrive, and we should all do our bit to not exploit it in any way and not demand too much of it. There are certain things which can trigger memories, even sometimes in dementia patients. Things such as aromas and melodies, but especially photographs. These days we often take photographs for creative reasons, but in those days, it was more snapshots of the time. Maybe we should all take more snapshots of our time here, for future generations to be able to see how things were in our days. Nobody said it would be easy. We foolishly thought our garden was dog-proof. From past experience, we should have realised that a dog will find a way of escape. Tarka is no exception. Last Sunday morning she escaped from our back garden for the third time. I let her out around 7 o’clock in the morning; I was still in my night attire. I walked down the garden with her. In no time she’d picked up a trail of a night-time visitor, probably a rat. (She’s already killed one which was taking a short-cut across our garden.) Nose to the ground, she was oblivious to anything other than her quest. I saw her one minute, darting in and out of the undergrowth. The next moment, no sign. I called – nothing – again and again, no movement or sight of her. The danger is that on the other side of the hedge is easy access to a road, busy at times. The hedge is not our boundary, but belongs to our neighbours. Only the previous Monday, the young man who helps us with the garden now had put mesh against the full length of the hedge, but Tarka is small enough to pull it up and wriggle beneath it. My heart pounding, I ran to the front of our house, opened the front door, and thankfully Tarka was running along the path adjacent to the houses towards me, looking very pleased with herself. As the title of this piece suggests, we’ve had experience of escaping dogs before. 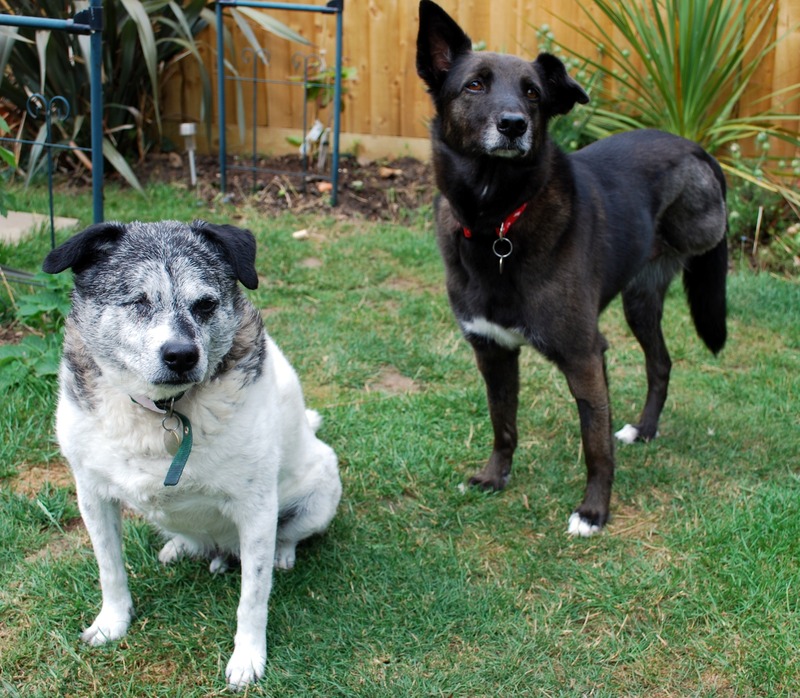 Our first two dogs were not prone to escaping, but when we moved to Spain to live, over 13 years ago, we inherited two dogs, Esky and Gizmo. Although the land we were living on was fenced in with good quality wire, both of them escaped regularly. They climbed over the top, or burrowed underneath it. Esky was the pack leader for the whole area (life is very different in Spain for dogs in the countryside), and we heard how he controlled the others when they were howling. One growl from him and they would stop. Gizmo just came back muddy as he’d rolled in the nearby stream. We didn’t have Esky for long; there was a lot of animosity between the two dogs, and Esky was taken to the local dog pound, where somebody could rehome him. He was so beautiful to look at that he would not have stayed long without somebody wanting him. 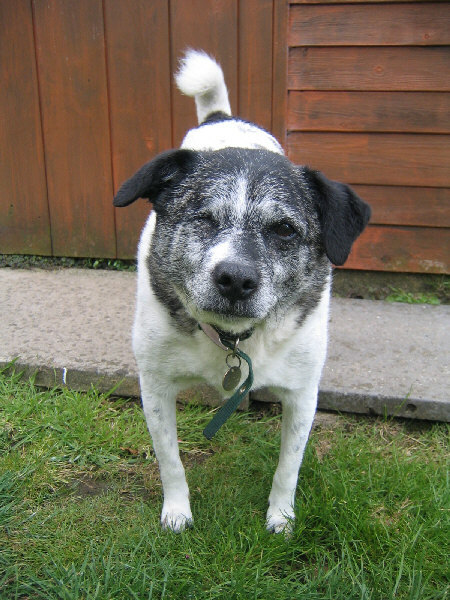 Gizmo of course stayed with us until last year when he passsed away at nearly 17 years old. 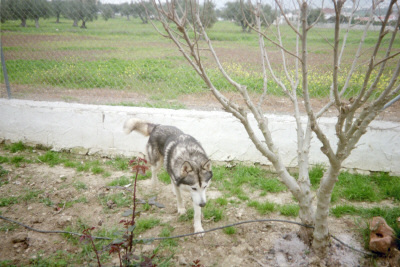 The next escapee was Cara – my beautiful dog brought up inside the trunk of an olive tree and raised in the wild. We moved house, and had fencing erected, but the workers did not do a good job and again the two of them, Gizmo and Cara, would find a way out. Not as serious a problem as it is here as there was so much land to roam. Still a worry though, especially as Cara was young and I never knew if she could find her way home, so we tried to stop the escaping, blocking up holes in the wires wherever we could. One day, when the orange pickers had arrived on the opposite side of a nearby river, Cara escaped and went visiting with them. I ran after her, but she was so quick and agile, and I rarely caught a glimpse of her between the rows of orange trees. Eventually she came to me, looking as if she was grinning at my worries! A dog with a sense of humour for sure. Cara with me in our Spanish garden. Dear Cara sadly passed away aged only 6 from bone cancer. She will always be ‘my puppy from a tree’. So, those are our experiences with these canine escape artists. Sir John Betjeman, who was Poet Laureate in the United Kingdom from 1972 until his death in 1984, considered that St Just in Roseland churchyard was the most beautiful on earth. He certainly had a point; it’s the most beautiful I’ve ever seen for sure. It must be what the Garden of Eden looks like. The church itself is small and attractive, dating from the 13th century (although it apparently has an older Celtic Heritage). It is its position though, which makes it so special, along with the wonderful plants. Set on the side of the creek with its outstanding beauty, it is surrounded by sub-tropical grounds. Of course, in that part of Cornwall, sub-tropical gardens are not rare, but there is such an air of peace at St Just and this makes it extra special. We have made several visits here before. 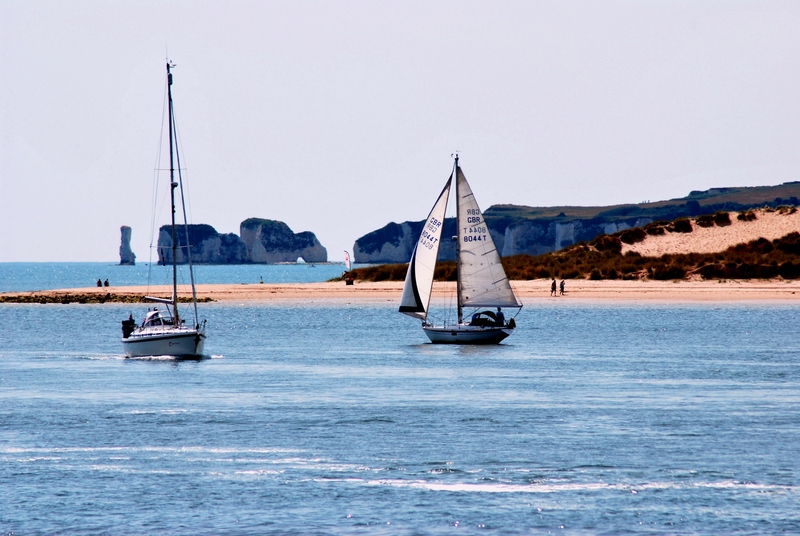 We used to live not too far from the Roseland Peninsula. We were there for about 14 years, and discovered this gem quite early on. Whenever we had visitors staying with us we took them. Without exception, they all found it delightful. We’d not been back to Cornwall for many years, but we’re now trying to fit short breaks away between our various medical appointments. Earlier this month we had a four-night break at St Mawes, near to St Just. It was a lovely nostalgic trip and we were able to meet up with friends we’d not seen for quite some time. The weather was kind to us for the time of year, so it all looked lush and wonderful. If you ever have the chance to visit, please do so. It is well worth it. Photos today are not connected to the words, but give a glimpse of summer views before they disappear for the winter. Some people don’t believe in coincidences. I find them fascinating. If you were to visit for example, a barely inhabited island in the Pacific, and on landing were greeted by a neighbour from your home town in England, that to me would be a coincidence. That actually happened to my brother. A while back I wrote about the coincidence of where Mike and I now live, and a painting by my father. There was another coincidence in our lives. This happened nearly 40 years ago. Mike and I had been married for a couple of years and had been living in a flat (apartment) over a freezer shop on Hayling Island, Hampshire. It was fine, about 5 minutes walk from the beach and convenient for local shops and our occupations. What we wanted though, was a garden, so we set about selling the flat. We moved to the mainland, which was joined to the island by a causeway, so didn’t involve a boat trip to get to work. The house we chose was in an area called Bedhampton and had a good-sized garden. Plenty of work to do in both house and garden but we didn’t mind that in those days when we were fit and active. We grew vegetables and kept chickens. Shortly after we moved there, my mother came to stay for a week or so. As we were walking from our house to the local shops, she suddenly stopped and pointed at a large house. ‘I know that house,’ she said. I could hardly believe it as I’d never heard of Bedhampton prior to moving to the area. It turned out that the house, just one road away from where Mike and I now lived, was the very house where my Mum and Dad had spent their honeymoon. It was war-time, and I think he must have been based at the time around the Naval bases of Portsmouth. There was not much time or money for a honeymoon, so they had simply enjoyed a few days not too far away. What quirk of fate brought us to that particular house? Was it coincidence or a fluke? Are our lives mapped out for us? Questions to ponder for us all. I’ve called this photo ‘pretty maids all in a row’. 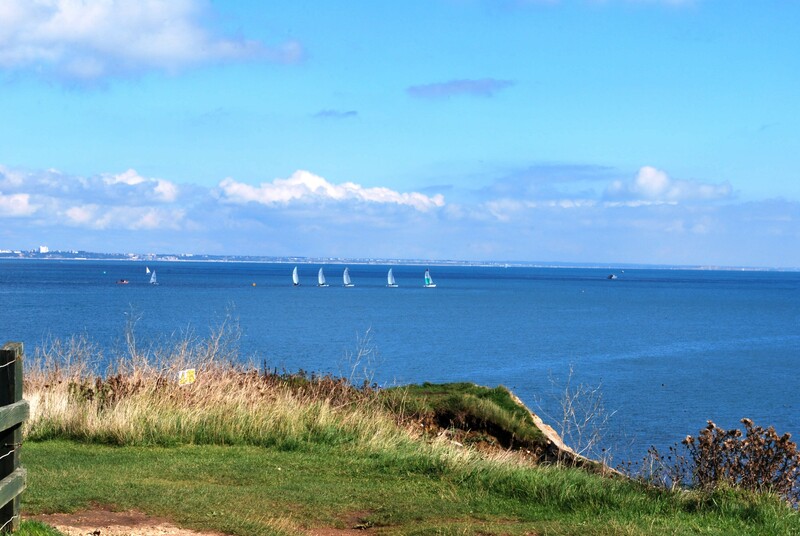 The sailing boats were out in force on Sunday morning. This was taken from Peveril Point near Swanage. Since 1977 we’ve had a dog, or even two in our home and lives, with just a month or two between them. Prior to that, as a child, my parents brought our lovely Labrador home for 15 years. Now, for the first time, I find our home empty. 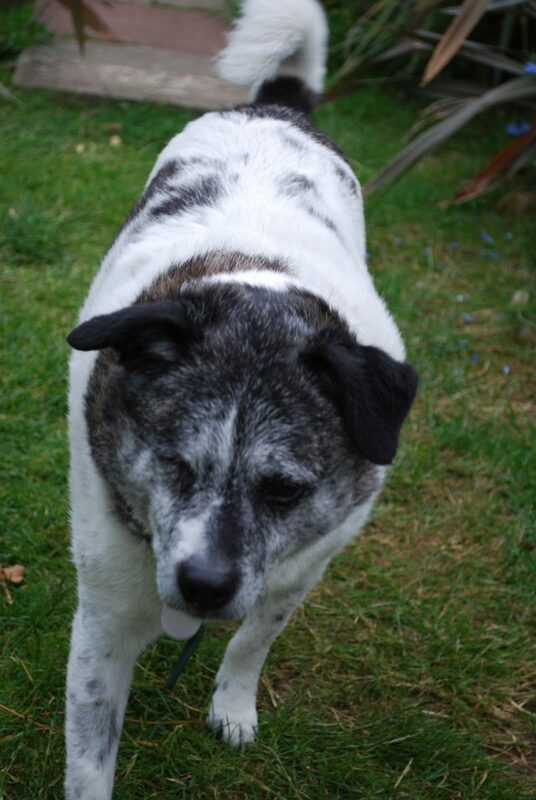 Our dear old dog passed away last week, aged nearly 17. Good going for sure, but it doesn’t make it any easier. Gizmo had quite a life. He was born in the Canary Island of Tenerife. He belonged to somebody we knew, and we met him there when he was young, while we were celebrating our Silver Wedding. Little did we know that one day he would come home with us. Gizmo moved to Spain with his owner, but sadly she did not keep him. We moved to Spain to discover that he needed a new home. From that time, he was my faithful friend; he seemed to know if I needed cheering up or felt ill, and always gave me a lick of encouragement. During his time in Spain with us, he lost an eye during an attack by another dog. This did not faze him at all. I think sometimes as he grew older, it was slightly more of a problem when things were on his blind side, but not noticeably so. While we lived in Spain, we acquired another dog, Cara, who was born in the wild and her mother brought her up inside the hollow trunk of an olive tree with her siblings. They had to struggle with life, those dogs living in the Spanish Campo or countryside, so we took Cara as our own and helped find homes for the other dogs. Cara was beautiful and she and Gizmo got on really well. When we returned to England, the two dogs had to wait in the kennels for us to send for them, as we had to find rented accomodation where we could have our pets. What a day it was, soon after we returned, to drive to Gatwick Airport to pick them up. They were as good as gold. I was so pleased to see them again. Another house move for us all came about after we found a place to buy, and this time I had to be careful that they didn’t escape from the garden into a busy road. We soon made it dog-proof. Cara could run like the wind, but sadly at the age of just 6, she was diagnosed with bone cancer and had a leg amputated. So, there we were, with one dog with one eye, and another with 3 legs. Cara initially did well, with several bouts of chemotherapy, but didn’t complete the course before she fell ill again and we had the sad decision to make to end her life. I’d like to think that I will have another dog, one who needs a loving home, before I end my days, but for the present Mike and I need a little break, some days spent on holiday. That and with health issues for both of us may mean that I shan’t have another dog, but my goal is still there.